For one of the most scenic train rides to be found anywhere, try the Paignton to Kingswear (Dartmouth) rail journey. On this holiday line, you can re-live the great days of steam railway travel. Your steam locomotive starts from Paignton Station and initially chugs past Paignton Sands and Quaywest Water Park. The rail journey not only takes in the spectacular Torbay coastline but also runs through the wooded hills along the Dart Estuary. Initially, this most picturesque of British rail journeys goes up a steep and rocky hill offering some wonderful views of the Devon coastline. After going past Churston, the train runs inland and proceeds along the Dart Valley before reaching Kingswear. From here, passengers have the option of visiting Dartmouth via ferry. Paignton is one of the three towns on the ‘English Riviera’ which is a stunning stretch of 22 miles of south Devon coastline. Paignton is a traditional seaside resort with long stretches of sandy beaches and a lively waterfront area and is popular for family holidays. Apart from steam train rides and river cruises, you can visit the endangered species at Paignton Zoo, or take a journey back in time at the 500 year old Kirkham House. There’s also the Oldway Mansion, once home of Isaac Singer of Singer sewing machine fame. 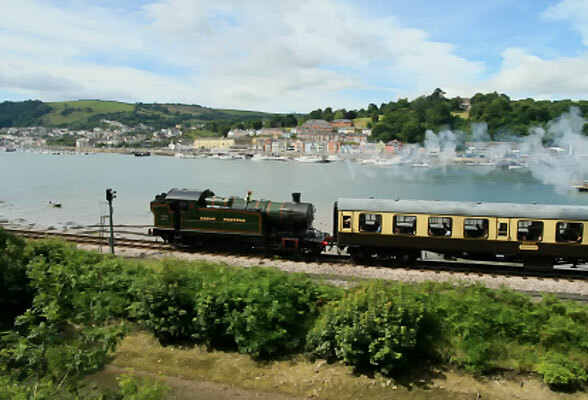 At the Kingswear Visitor centre you can learn about how steam engines work, the history of Dartmouth and the variety of wildlife that can be seen on the River Dart. Amble along Dartmouth’s ancient narrow streets and you’ll find boutiques, shops, art galleries and delicatessens. A cobbled market place features colourful stalls and at the Farmers’ markets check out the local produce that find their way into the local gourmet restaurants, pubs and cafes. For your holiday in Dartmouth, there’s a wide variety of accommodation from luxury hotels, inns, pubs, graded bed and breakfasts and guesthouses to self catering cottages, barns, apartments or camping/caravan parks. In Dartmouth you can sail, fish, explore by boat or come at festival time. From Dartmouth, you can take the steam train ride to Paignton for a treat, or enjoy visits to the Castle, the famous Britannia Royal Naval College and National Trust Gardens. You can be as energetic as you want and enjoy the South West Coast Path or simply laze around on the beaches. What's your next move, after having read this post? Looked up pictures on this and have to agree that this could be a really enjoyable. I have been around Devon area and the beauty is unquestionable! It’s just amazing! Devon and Cornwall regions are often considered one of the less developed railway regions of Britain, but the ultimate joy it brings when travelling on line is great. Last summer I planned rail holidays trip to Cornwall and it was a memorable experience.